3 or 5 ? Days or Grades ? The choice is yours?.. 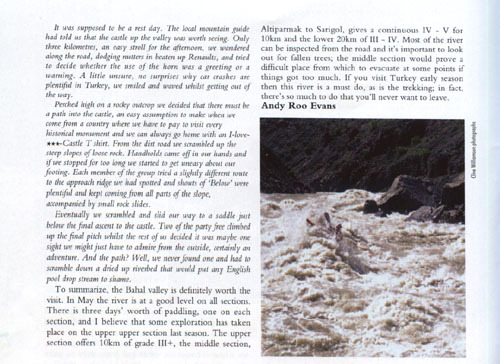 One of the reasons for an early season trip to Northeast Turkey was to explore the tributaries of the Coruh. We had heard good things and also thought that a warm up on the lower volume side streams would be prudent before tackling the fast flowing, voluminous streak of brown that we had driven past on our way to Yusufeli. At this point the river was about thirty metres wide. We were sat on the balcony of the Marzhen Restaurant having arrived in Yusufeli in need of food and refreshment. It certainly looked like we were going to be in for a fun trip as this was going to be one of our warm-up stretches before tackling the Coruh. The silty grey/brown water was speeding past us in a similar fashion to the Gyr in late afternoon. The 20-kilometre stretch of 3/4 was going to be fun in two days time. The Bahal valley is home to a major tributary of the Coruh, which explains the development of the area as a place to live throughout its history. The lush vegetation gives an alpine feel to the valley and as you drive up you begin to appreciate why people have chosen this place as home. Relics from the 10th century can be seen high on the side slopes. The castles and chapels that you see are what are left of the communication system of inter-visible signalling posts. It is possible to visit some of these sites although it is recommended that you speak to the locals to discover which are the easiest to visit. Our local told us of a couple of chapels and suggested visiting the castle just outside Yusufeli, although he was quite surprised when he found out that we had seen the inside of the castle perched high on a crumbling cliff. As we drove up the road towards Sarigol we realised that we had managed to secure a good price on the Minibus as the road deteriorated and we guiltily figured out why our first offer had been laughed at so loudly. From the bus we could see a fun bouncy section occasionally obstructed by the odd tree but mainly open and likely to be big. It looked reasonable from the road and we had quickly discovered that the scale of the surrounding countryside meant that at water level things were much bigger than they had first appeared. We put on by the road bridge in burning hot sun and sped off down river. It was continuous, fast, cold and in places surprisingly steep. The eddies were rare and poorly formed and if you were a little imprecise on the break-in you could find yourself scrabbling to stay in the slacker water. The Bahal offers something for everyone from the competent wild-water paddler right through to the accomplished rock dodger. In the upper reaches the technicality pushes III+ but in the spring this is fast flowing and the wooded banks are prone to dumping the odd trunk in your path. Be prepared to stop and portage if necessary. The valley has been cut deep by the river and the water is cold, the drive up exposes the snow-capped mountains, the source of the river. The best put-on will become obvious and indicated by either your driver or vehicle refusing to go any further or the stream being to bony. Take your pick. As you speed past the confluence with a fairly major stream coming in river left be prepared to take out, unless you want to run the middle Bahal. Just below the village at the confluence the difficulty picks up and the drops steepen becoming significantly harder. 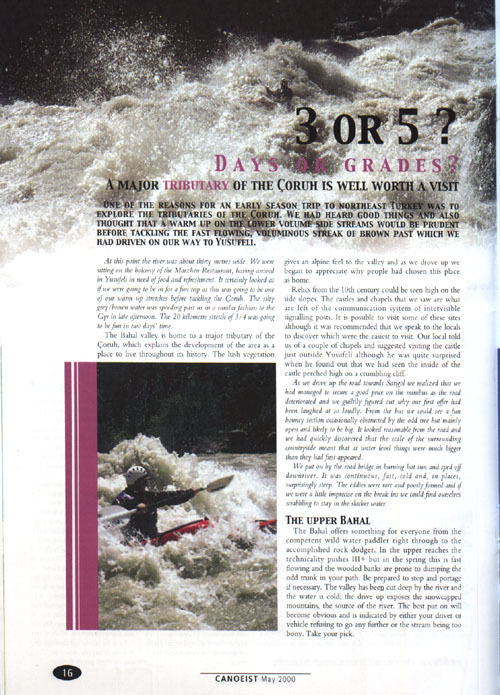 This section is pushing grade V and requires confident tight paddling in small groups. You can view some of the run on the ride up, the eddies small, the current fast, it should be obvious whether you'll be running it or not. A serious section especially when the lower run is really pumping. The difficulties are about 3-4 km in length and eases up over the last two kilometres into Sarigol. Under the road bridge on river left is an ideal access/egress point. With any luck the sun will be shining and the sky blue as you stand on the left bank, upstream you can see Sarigol and downstream the mass of blue and white is flying off round the corner in the distance. The bumpy drive up gives away the character of the paddle, early season it's a fast roller coaster ride for 20 km back down to Yusufeli. The grade never harder than IV it's a non stop bounce with a few testing corners. At the time of writing and in early season a collapsed bridge may cause trouble for rafts but is likely to give enough clearance for the kayaker. Tree hazards pose other problems and at one point a low-slung wire closely follows a river-wide ex-tree. A little later in the season the speed and volume ease to give a more relaxed ride. The action keeps up right through the centre of Yusufeli and for the poseurs among you there's always an interested audience. If you take out at the confluence be sure not to miss playing in the whirlies where the Bahal meets the Coruh. Alternatively you can take out higher up on the left bank which gives you a short bimble back upstream to the bus station or "home" if you're staying in the town. 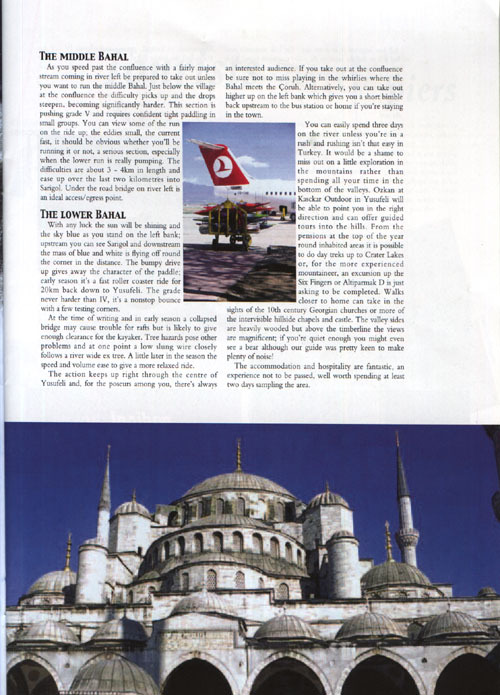 You can easily spend three days on the river unless you're in a rush, and rushing isn't that easy in Turkey. It would be a shame to miss out on a little exploration in the mountains rather than spending all your time in the bottom of the valleys. Ozkan at Kasckar Outdoor in Yusufeli will be able to point you in the right direction and can offer guided tours into the hills. From the Pensions at the top of the year-round inhabited areas it is possible to do day treks up to Crater Lakes or for the more experienced mountaineer an excursion up the "Six Fingers" is just asking to be completed. Walks closer to home can take in the sights of the 10th Century Georgian Churches or more of the inter-visible hillside chapels and castle. The valley sides are heavily wooded but above the timberline the views are magnificent, if you're quiet enough you might even see a bear, although our guide was pretty keen to make plenty of noise !! The accommodation and hospitality is fantastic, an experience not to be passed, well worth spending at least two days sampling the area. It was supposed to be a rest day. The local mountain guide had told us that the castle up the valley was worth seeing. Only three kilometres, an easy stroll for the afternoon, we wandered along the road dodging nutters in beaten up Renaults and tried to decide whether the use of the horn was a greeting or a warning. A little unsure, no surprises why car crashes are plentiful in Turkey, we smiled and waved whilst getting out of the way. Perched high on a rocky outcrop we decided that there must be a path into the castle. An easy assumption to make when you come from a country where you have to pay to visit every historical monument and you can always go home with an "I love **** Castle" T-shirt. From the dirt road we scrambled up the steep slopes of loose rock. Handholds came off in our hands and if you stopped for too long you started to get uneasy about your footing. Each member of the group tried a slightly different route to the approach ridge we had spotted and shouts of "Below" were plentiful and kept coming from all parts of the slope accompanied by small rock slides. Eventually we scrambled and slid our way to a saddle just below the final ascent to the castle. Two of the party free climbed up the final pitch, whilst the rest of us decided it was maybe one sight we might just have to admire from the outside. Certainly an adventure, and the path ? Well we never found one and had to scramble down a dried-up riverbed that would put any English pool drop stream to shame. To summarise the Bahal valley is definitely worth the visit. In May the river is at a good level on all sections. There is three days worth of paddling , one on each section and I believe that some exploration has taken place on the upper-upper section this season. The upper section offers 10 km of grade III+, the middle section gives a continuous IV-V for 10 km and the lower, 20 km of III-IV. Most of the river can be inspected from the road and it's important to look out for fallen trees, the middle section would prove difficult to evacuate from at some points if things got too much. If you visit Turkey early season then this river is a must-do as is the trekking, in fact there's so much to do that you'll never want to leave.